In late January, Dean Peter Miller launched an exciting new initiative for the BGC: our first attempt to connect our institute on West 86th Street with a partner institution abroad. This happened via our first telepresence seminar with The Max Planck Institute for the History of Science in Berlin. At this two-hour session Doris Oltrogge spoke at the Planck Institute’s colloquium “Art and Knowledge in Pre-Modern Europe”, an ongoing series for them. Her topic was “Manuscripts and Prints: Exchange, Use and Reading of Recipe Texts in Early Modern Times” Dr. Oltroppe is a Research Associate in the Cologne Institute of Conservation Sciences at the Cologne University of Applied Sciences. The BGC audience was a full participant in the seminar. 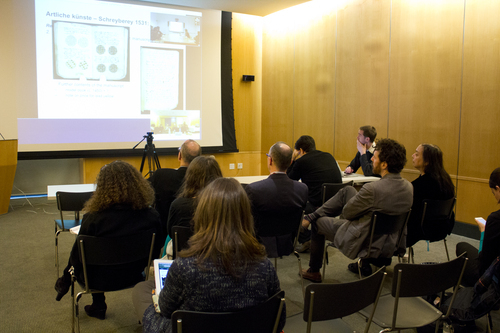 Those present in our seminar room had a chance to ask the speaker in Berlin questions via our video link. At the BGC, the seminar came with morning coffee; in Berlin, it was afternoon tea. In both places, it was a complete success.